Re-Upholstered Chair Garage Sale Find - Sew What? Sew Anything! 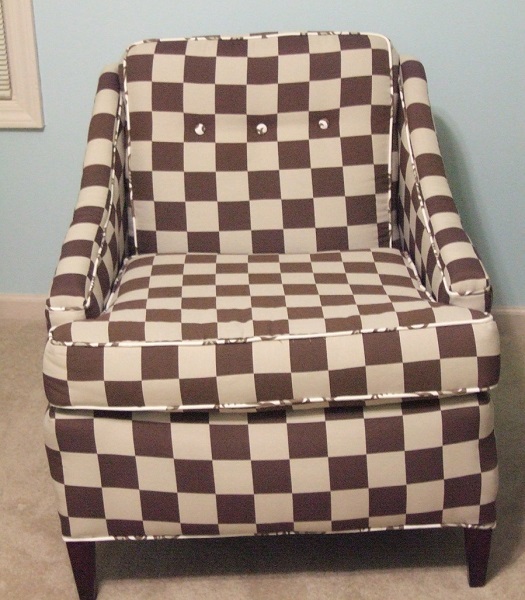 This checkerboard pattern re-upholstered chair is great for a bedroom and super fun in a rec room. My husband found this chair at a garage sale in our neighborhood. You can either hit a bonanza or go bust when you are saving a piece of furniture from the dump. It is hard to tell what kind of craftsmanship was put into the original construction until you pull it apart. As I started pulling off the old fabric I realized this chair needed more work than originally thought. Lucky for me it was a project with no client expectations.From the bottom up, I had to tie the springs together, add new foam and stuffing to this chair. I found this great fabric on sale at one of my favorite stores and the buttons and trim are from an Amy Butler fabric. This chair has turned out to be my daughter’s favorite reading chair. I often find her with her legs slung over the arm of the chair intently studying. I’d say the client is pleased with the handiwork.